A monochrome multifunction printer (also called all-in-ones) combines a monochrome laser printer, color scanner, copier, and sometimes a fax machine into a single device. As with a color multifunction printer, having all these functions in one unit not only saves room, but it can also be more affordable than buying separate individual devices. If you already have a color printer, or if your prints consist of text and some simple graphics, a monochrome printer may be all you need. Here are some tips to keep in mind when shopping for a MFP. Note that some of these tips mirror our buying advice for both color MFPs and color laser printers. Later in the article, we’ll share a pair of printers that fared best in our tests of monochrome all-in-ones this past year. 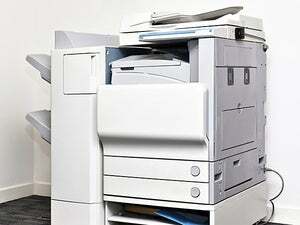 Better price per page: Laser MFPs are good for medium to large businesses that print documents often. The initial cost of a monochrome laser MFP may seem a bit pricier than a color inkjet MFP, but toner tends to be cheaper than ink in the long run. The price per page for a laser printout is cheaper than ink. Text specialists: Monochrome laser MFPs are ideal if you print text documents, as well as spreadsheets, basic charts, business graphics, or grayscale artwork. Speed: Print speeds are usually rated by how many pages per minute (ppm) a printer can produce. But not all manufacturers use the same quality setting or the same type of document when determining their speed rating. Also, the speed rating may be only the amount of time it takes to put toner to paper and output it. It may not include the actual data processing of the job. Double-sided: A built-in duplexer allows you to print on both sides of a page, which helps saves paper. However, duplexing often significantly increases print time. Paper capacity: Most base model MFPs hold between 100 and 250 sheets of paper. 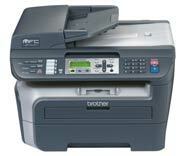 If you plan to print frequently, consider a MFP with a large paper capacity, or optional additional paper feeders. Color scanner: Even though they can only produce grayscale prints, monochrome MFPs usually come with a good, general-purpose color scanner that performs 24-bit scans. These scanners can handle business documents, charts, and artwork. They’re also suitable for non-professional photos. Obviously, if you want to print your color scans, you’ll have to find another printer. If you plan to scan frequently, look for one-button scanning, which lets you scan an item without using the software interface on your Mac. Just place an item on the scanner, press a button on the MFP, and the scan is automatically saved to your Mac. 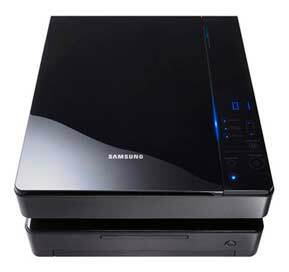 Making copies: The scanner on an MFP as does double duty as a copier. Look for an automatic document feeder if you want to be able to copy multi-page documents. Connectivity: A majority of MFPs have USB for connecting to a single Mac. If you have an AirPort Extreme, AirPort Express, or Time Capsule at home or in a small business, you may be able use USB to connect the MFP to the network device and share the printer over a network. To connect to a medium of large business, look for Ethernet or wireless connectivity. This may not come as standard equipment, and may be an additional cost. Some MFPs also support Bluetooth for printing from portable devices. Some MFPs have features that let you perform tasks remotely over a network on a shared MFP. For example, you can scan a document and the MFP distributes the scanned file to computers on the network. In our experience, these features often do not work on a Mac, or they have inconvenient workarounds for Mac compatibility.